Villa Kalkan Rose is a beautiful villa. 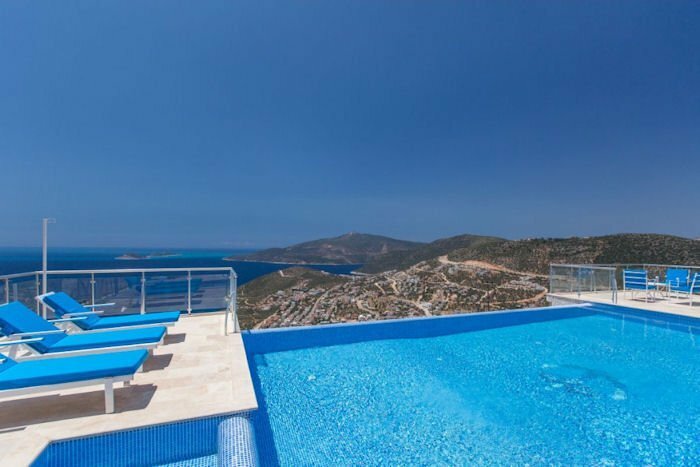 Villa Kalkan Rose is a beautiful villa, furnished to a very high standard and uniquely every room offers stunning uninterrupted views over the bay of Kalkan. The sea views from this area are arguably the best on the Island, and this villa helps to truly make the most of this. The villa boasts a huge pool terrace to enjoy the views, an outdoor dining area right on the terrace-edge, and some of the bedrooms have julienne balconies and opening double doors to really bring the views inside. The extremely spacious pool terrace is surrounded by opaque fencing for maximum impact, and there is also a large roof terrace. The villa is incredibly private, as the next house is over 100m away. The private outdoor space consists of a beautiful sun terrace with rattan sunloungers, sunbathing area, private garden, infinity swimming pool, stone built BBQ, parasols, and an outside shower. The pool is not only an infinity pool, but also has a beautiful jacuzzi section and a childrens pool. There is secure private parking at the villa too. Villa Kalkan Rose is only a 5 minute drive away from the sea, town, restaurants and shops. The centre of Kalkan village is a 5 minute drive away and there is a local greengrocer within a short walk that can provide you with basic essentials. The villa is suitable for families, groups of friends and would make a very special honeymoon property. As you would expect, the villa is equipped to a very high standard, and is air-conditioned throughout, and has a beautiful travertine marble flooring. in the lounge there is a sofa bed which is suitable for up to two extra children. The large open plan lounge and kitchen diner is modern and boasts a fully fitted, high standard kitchen and ironing facilities. The living room has Satellite TV, Wifi, a stereo system and a DVD player. All bedrooms have hairdryers in them.